Give your pupils the chance to collaborate on a mutual project that will directly enhance their school environment. Facilitated by experienced artists, the pupils work together organising ideas and making artistic decisions. 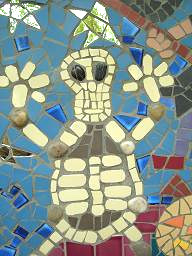 The children’s drawings are directly transferred into mosaic, painted murals or sculpture. Curricular topics can be integrated into the theme. Our workshops include displays, books, mosaic samples, an excellent range of materials, project camera (for pupils to document work) and stimulating teaching.